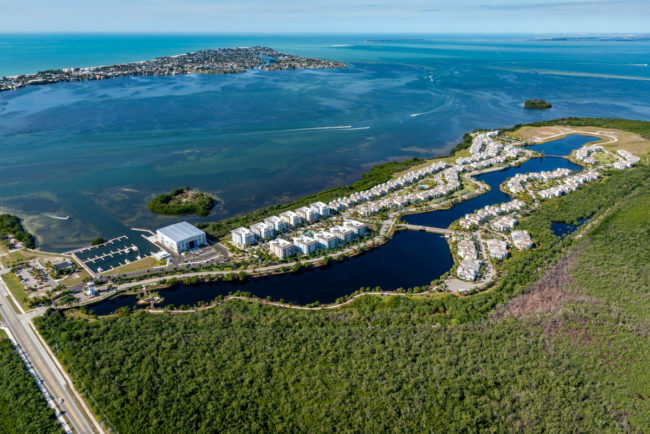 On Saturday, February 9, 2019, it opens to the public with a celebratory event Sarasota-Bradenton’s Newest Marina & Boathouse at One Particular Harbour Margaritaville located at 12300 Manatee Avenue West, Bradenton, FL 34209 in a spectacular setting on the Anna Maria Sound side of Perico Island. 59 wet slips – for boats up to 50 feet. 128 dry racks – for boats up to 42 feet. Annual, monthly, and overnight transient. Floating fuel dock with alcohol-free gasoline and marine diesel. Lift capacity to 30,000 lbs. Building rating 150 MPH, exposure D.
Direct , no-bridge access to Anna Maria Sound, Tampa Bay and the Gulf of Mexico. Publix, CVS and restaurants nearby. Compass by Margaritaville Hotels & Resorts and Floridays Restaurant & Grill – coming in 2019. Easy cruising distances to Longboat Key, Sarasota, Egmont Key, Downtown St. Petersburg, nearby waterfront restaurants and more! One Particular Harbour is being developed by Minto Communities in partnership with Margaritaville Holdings and RONAUTICA MARINAS participates in this project as gangways, pontoons and fingers supplier.